Small burlap bags are useful for gift cards and party favors while larger burlap bags can hold coffee beans or a bottle of wine. Crafters with basic sewing skills can make a simple drawstring burlap bag in less than 20 minutes. Press the burlap with the iron set on the cotton setting with steam. Use the steam generously while pressing. Determine how large you would like your bag. Add 1/2 inch to the width and 1 1/2 inches to the length of the finished bag and then measure out the size you will need and cut two pieces. 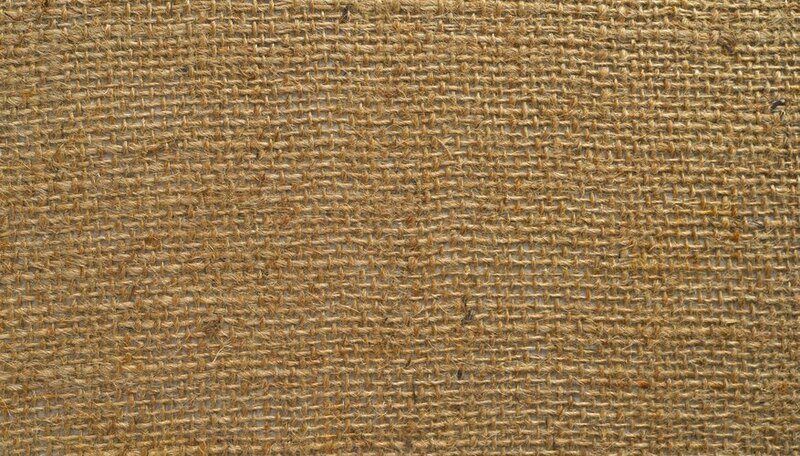 For example, a 5-by-7 inch finished bag would need two cut pieces of burlap measuring 5 1/2-by-8 1/2 inches. Pin the two pieces together with the right sides facing each other. Sew the two sides and the bottom of the bag together using 1/4 inch seam allowance and a zigzag stitch. Fold the top edge down 1 inch and press with the iron. Sew 1/4 inch from the raw edge of the fold using a zigzag stitch to create the channel for the drawstring. Flip the bag right side out. Use a chopstick to push the corners out. Iron the bag flat using steam. Cut a piece of twine two and a half times the width of the bag. For the earlier example, we would need a piece of twine 15 inches long. Tie a knot at one end of the twine. Pin the safety pin through the other end of the twine. Mark the center of the drawstring channel on the front of the bag with chalk. Use the skewer to move the burlap fibers out of the way on the mark. Create a small hole in the top layer of fabric. Make it large enough for the safety pin. Do not go through both layers of burlap. Slide the safety pin into the channel. Work the pin around the channel and pull it out of the same hole. Remove the pin and tie a knot in the end of the twine. Ask local coffee shops if they have leftover burlap coffee bags that you can recycle into bags. Paint and stencil the bags to embellish.